I ‘processed’ (nice way of saying ‘slaughtered and butchered’) four roosters last weekend. Don’t worry – there are no graphic photos in this post. One was an Australorp that someone gave us – they couldn’t keep him, as they lived in town. I couldn’t believe my luck: I’m gearing up to breed Australorps (we have 6 hens ready to go), and a free one drops in my lap! When I saw him, though, he had red in his feathers – so really just a cross. I had already agreed to take him, so I couldn’t back out; his owners had no other options. He did make a good rooster for the hens, looking after them while I continued looking for a pure-bred. Besides not being what we wanted, this rooster had been getting more and more aggressive over the past few months. He attacked my daughter and wife whenever they went into the pen, and he had taken to attacking me a couple of times a week while I was doing my daily feeding rounds. In the past week, he attacked me every day! Not good. The other three roosters were dropped off here over the past few months by various people who had hatched chicks but didn’t want to keep the boys. I’m not one to knock back a free meal :-). I’m getting better at processing chickens. In the past, I’ve usually just done one at a time. If you want to get good at it, I really recommend doing a bunch in one day. You develop and hone your technique with each one, trying different things, and by the end you’re pretty good at the whole procedure. I was also better organised this time than I have been before (I felt I needed to be, doing four at once!). 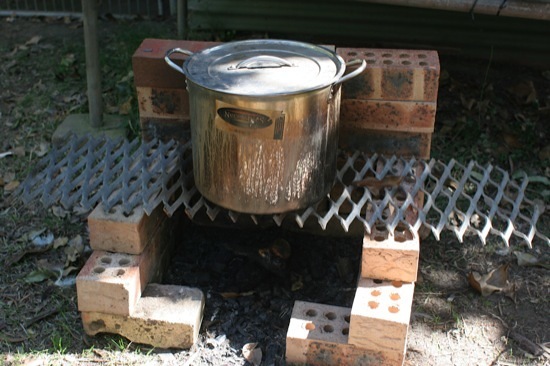 I built a makeshift barbecue out of some spare bricks, put a grille over the top, and lit a fire to heat the scalding water. I used a cooking thermometer to get the water temperature just right – about 65 degrees C (about 150 degrees F) is perfect. Much better than my usual guessing. I killed the birds one at a time, scalding and plucking one before starting the next. To scald properly, you dunk the bird for 5 seconds or so (use a stick to get them fully under, and jiggle them to get the water in under the feathers). Pull it out and test a single wing feather – if it slips out easily, scalding is complete. If not, dunk it again for a few more seconds, and test again. It can take 3 or 4 or more dunks to get it right (this is one thing I got a better feel for with each rooster). I plucked the birds on a small portable workbench over a wheelbarrow, with a bucket of water on hand for rinsing my fingers when too many little feathers got stuck to them. Collecting the feathers like this made for a much easier cleanup afterwards! To butcher the birds, I used my backyard sink workstation. 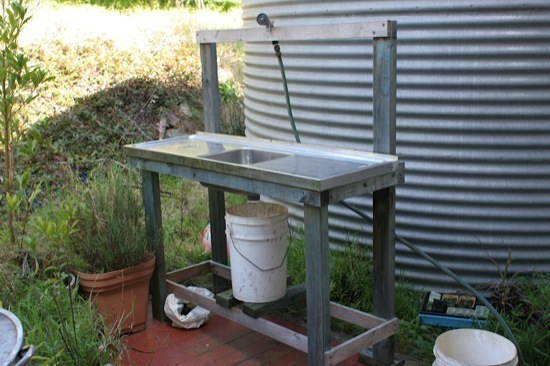 Besides chicken processing, this is really handy for scaling and cleaning fish, and washing vegies before bringing them inside. The basic method of butchering I use is Herrick Kimball’s How To Butcher A Chicken tutorial. That site explains it way better than I can here, and is a very straightforward and detailed tutorial to follow. I had a covered Esky full of cold water and freezer bricks on hand to put the chickens in as I completed each one. Two of the roosters were fairly young, so I froze those ones whole for roasting. The other two were larger, but older, so I broke those down and packaged them into meal-sized portions for freezing. They’ll be tastier than the young ones, but will need long slow cooking before they’ll be tender. I kept the offal (livers, hearts, gizzards, necks, feet) for later use. I gave the testicles to Jessie the dog (rooster testicles are inside their bodies, and are actually quite large!). The rest (heads, intestines, lungs, etc) went into the compost, as did the feathers – lots of nitrogen there. The bucket under the sink drain catches all the wash water, along with blood, stray feathers, bits of gunk, etc. I tip that onto the compost as well. The whole exercise took me a few hours, but I spent a lot of time mucking around setting up the barbecue, cleaning down the workstation, and getting everything prepared before I actually got started. It’ll go much faster next time, now that I know exactly what I need. We’ve now got a whole bunch of really tasty meals in the freezer, ready to go. Incidentally, supermarket chicken doesn’t taste anything like the real thing – the only chicken I’ve ever bought that was on par was one from my friends Fiona and Adam at Buena Vista Farm in Gerringong. They are just getting started growing pastured poultry, free range eggs, pork and more. Update: Thanks to Sailors Small Farm’s recent post on their poultry processing day, I discovered these two great videos from Joel and Daniel Salatin – watch closely, and you’ll see how to eviscerate and break down a chicken about 20 times faster than I do it :-). Do you process your own chickens? What method do you use? Any tips to share? @farmer_liz: I’ll do a post soon on what I did with the chicken livers. They are worth keeping! We haven’t had trouble with putting heads, guts etc in the compost heap. I do turn it over a bit, so maybe that discourages scavengers? I’ve got a problem with rats in the chook shed, though – need to find a solution to that one! I was going to “process” my pure Australorp rooster but bottled & gave him away. But I have eggs in the incubator & the plan is for any mixed breed roosters to end up in the pot. What is the best age for eating? And how do you kill it? We like the idea of the “cone of death” which we saw on Gourmet Farmer, anyone tried it? Also how long do you hang it for? Very envious of your sink set up Darren, thanks for an informative & timely post. Would love to read of others experiences in this field, any website directions gratefully received. @Kate O: I’ve found that roosters are ready for eating when they start crowing properly. They seem to be close to fully-grown, and still nice and tender. It usually takes me a few weeks (sometimes months!) after that point before I get a spare day to process them, though. I kill them similar to how Gourmet Farmer did it, although I don’t cut the heads right off. If you just slit their throats, the heart keeps beating for a few more seconds and gets more of the blood out. They lose consciousness immediately because of the sudden loss of blood pressure. Aggressive roosters are just trying to assert a pecking order. The best way to put him in his place is to carry some pebbles, chunks of tree bark, etc.. and to throw them at the rooster when he looks aggressive. They hate that. After a few days of that, they should accept you as the top dog, and the aggression stops. But every member of the family has to do it too, otherwise the rooster might believe he is below you, but above your wife and daughter in the pecking order. @Eric in Japan: Yep, you can dominate the rooster and assert yourself at the top of the pecking order. I do that, but it doesn’t stop young upstarts from challenging you occasionally. And because I’m only in the pen once a day for a short time, I don’t think the rooster really sees me as part of the flock – maybe he thinks I’m the top rooster of a neighbouring flock, and because I leave and don’t stick around his attacks are scaring me off? Here’s a good page on keeping roosters in check. This guy was always going to be food, though, so I didn’t put so much time into him. It took me longer than I expected to get around to processing him, so I made the mistake of letting him slip too far. We process our old laying flock every two years, about 40 birds usually. Our elderly neighbour comes over and shares the work, and in return, can take home as many birds as he cleans. He cooks them up and freezes the meat for dog food. I am seriously envious of your worktable/sink thing. I have a “special” table cloth that goes on the picnic table and gets bleached and rinsed before and after every use, plus two chopping boards, same treatment. I buried the guts, heads and feathers last time we did this, and was pleased that we had no issues as a result – we have rat and racoon issues here, and I was worried they would pull it out of the compost if I put it there, but really didn’t want to send it to landfill either. Hence the burying, as a compromise. We actually skin our old birds, since we’re not going to roast them, we don’t want the skin on them anyway. Skinning is quite quick and skips that whole scalding/plucking step, which I personally have a hard time getting right anyway. Old layers do not taste like young roosters, so these birds are all for soup stock and stew (or dog food in my neighbour’s case). @Sailors Small Farm: I can’t imagine processing 40 birds in a day! I guess with a few people you must get quite a productive production line happening. It seems a shame to use good chickens for dog meat, but I’m sure the dog appreciates them! I usually skin older birds as well. We haven’t had any of those for a while, since our whole flock was wiped out by foxes last year. That sink bench is fantastic, I’m so glad I built it. It was really cheap and easy – I posted about it here. @Darren Thanks for the link on keeping roosters in check! I never took it that far before, but it makes a lot of sense. I haven’t done this yet, but I am working up to it. One of my biggest concerns is how we will go starting with day old chicks and then still bring ourselves to slaughter them – particularly with the kids heart-strings involved. Your method of collecting other people’s unwanted roosters won’t work for us, as we have too small a space, and are too close to our neighbours. I think the solution is likely to be planning to keep a couple of hens and process the rest, but of course there’s only so often we can do that – we have three chooks now and they don’t quite supply all our egg needs, but very close. One or two more would be the most we could comfortably keep I think. Anyway, thanks for your post & links. I am reading as much as I can about the process. @Kirsten: The first time you do it is going to be hard, there’s no way around that. But once you’ve done it a few times, it’s not so bad – but still never easy. It certainly makes you very mindful of where you food comes from! You might be able to take one unwanted rooster from someone else, and process it on the same day so you don’t annoy your neighbours, just for the experience. It might be easier if you’re not attached to it that first time. I want an outdoor sink. @Fi: Hehe, the sink only took a couple of hours or so to knock up, and cost bugger-all. The only hard part was waiting for a stainless steel single sink with double draining racks to cross my path. I keep a long mental list of parts I need for various projects, and snap stuff up at garage sales, tip shops, friends’ sheds, etc :-). I’ll keep you guys in mind next time I have chooks to do. And feel free to sing out if you need a hand!